Do We REALLY Cling to the Christopher Reeve Version of Superman? The answer, according to Man of Steel director Zack Snyder, is yes. Do we have good reason to do so? High school friends Jerry Siegel and Joe Shuster probably never imagined that the comic book character clad in a red cape, blue tights, and stylized red and yellow ‘S’ insignia on his chest that they created would become an American and global icon. Since the first issue of Action Comics hit the newsstands on April 18, 1938, Superman took off in a single bound and, aside from helping establish and revolutionize the superhero genre in comic books, he established his own self as a brand and icon in not just comic books, but also radio serials, cartoons, television series, and films. In the latter two media we have seen nine actors don the cape as the Man of Steel. Outside of the character drawn on an artist’s easel or now on a desktop or pad, almost all of us can admit when thinking of Superman in real time, with no doubts, Christopher Reeve automatically appears in our minds. In fact, he is etched in our minds. Man of Steel was a pretty good start to a reboot of the Superman franchise, and I am looking to the sequel with Ben Affleck as Batman in May of 2016. I will also note, I was a fan of the 2006 Superman Returns. While the story was a little weak, I saw it as more of a sequel to the first and second Christopher Reeve films (and as an homage to the late actor, who died in 2004), which are the best in the series. 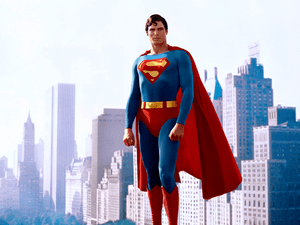 Saying that, I must admit, that I am like the majority who, when it comes to the Metropolis Marvel, cannot picture anyone other than Christopher Reeve wearing the blue and red outfit. And, if it continues past the next sequel, the new Superman franchise will have an uphill battle to even reach this status as the Alexander and Ilya Salkind-produced movies ever did. 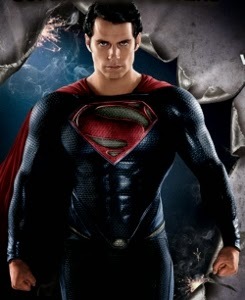 Henry Cavill did a decent job in Man of Steel. I do look forward to seeing him in the sequel. And I do understand completely Zack Snyder’s depiction of violence in its true nature versus sanitizing it with lack of consequences, as he showed in the film version of the graphic novel Watchmen. I am not disregarding any of this. At the same time, there is something about Christopher Reeve and the Reeve films (even through the lower quality third and fourth films) that makes them timeless almost 35 years later and still gets you to believe that a man can fly. First released in December of 1978, Superman The Movie was greatly received and made over $300 million at the box office worldwide. It had a screenplay co-written by The Godfather author Mario Puzo (who was credited with the story). An all-star cast including Marlon Brando as Jor-el, Glenn Ford as Jonathan Kent, and Jackie Cooper as Perry White (with cameos by Kirk Alyn, who played Superman in the late 1940s film serials, and Noel Neill, who played Lois Lane in the serials and later in the 1950s TV series). Special effects were done by John Dykstra, who did the spectacular and then-state of the art effects for Star Wars. And there was also triumphant score, including the love theme, composed by John Williams. The Julliard-trained Reeve, basically an unknown at the time and who had never read a comic book nor was a Superman fan, portrayed a hero that was not just a steel-jawed cardboard cutout. This scene shows how he actually played TWO separate characters rather than one: playing Clark Kent in his clumsy and mild-mannered demeanor and then as a heroic, confident hero. With the emotional depth and sincerity that Reeve delved into to make Superman more than just a comic book character (along with the production quality of his films, notably the first two), he crystallized how Superman is seen in our minds and will be for a long time to come. While other actors have portrayed Superman after Reeve’s final appearance in Superman IV: The Quest For Peace in film and TV, they quite haven’t left the same impression. I will also tie this up by noting how Christopher Reeve, the man himself, was a hero in real life who inspired and made a difference even more, and indirectly and without intention cemented people’s association with him as Superman. His activism included leading a protest march in 1987 in Chile against then-dictator Augusto Pinochet’s threat to execute 77 actors for alleged “subversive” work. And most importantly, after his full paralysis in 1995 in a horse accident, he fought hard for more research into spinal cord injuries. And it is paying off. For many, Christopher Reeve is the quintessential Superman. There will always be the comparison. It will be the same for Wonder Woman. Any portrayal will always be compared to Lynda Carter. My favorite will always be George Reeves.